About a dozen parents joined a peaceful protest against Broward Schools Superintendent Robert Runcie outside of Marjory Stoneman Douglas High School, on Feb. 4, 2019. "He constantly says, 'I'm going to do something. I'm going look into it and research it next week,' and then three, four, five months later, nothing comes of it," parent Steven Brown said of Runcie. "He promised us metal detectors at the beginning of school. A week before school he said, 'Oh, we got some new information. They don't work.'" Brown, whose son is a sophomore, said he didn’t want to go into the meeting because he doesn't believe Runcie will act on past promises like metal detectors. Just before school started last August, Runcie reversed a plan for installing metal detectors at Stoneman Douglas and eventually other schools. His decision was in response to a report from a contractor assessing the district's safety measures, in which the experts said metal detectors alone would be ineffective without a significant investment in new staff members to search students' belongings. 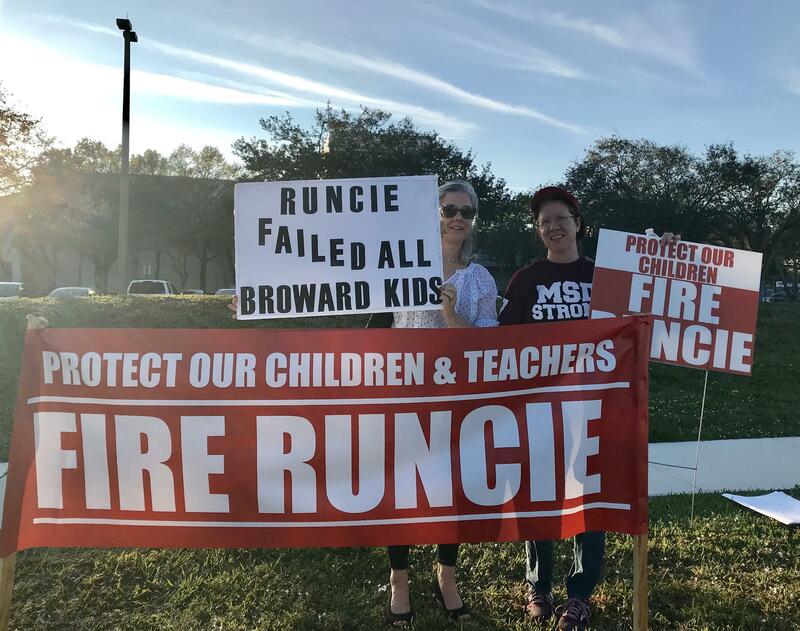 Runcie has been criticized for canceling a public meeting organized by a parent group at Stoneman Douglas that was planned for Jan. 24. 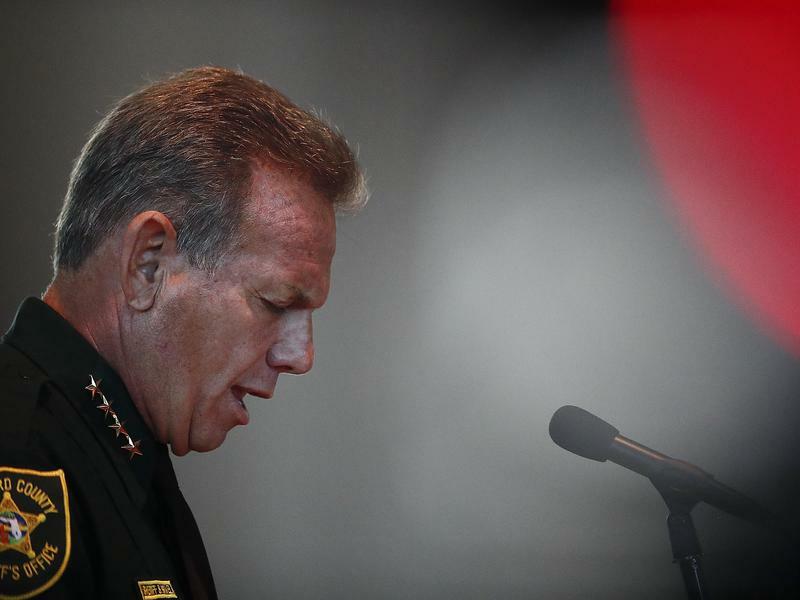 He opted instead for four private meetings with Stoneman Douglas parents, one for each grade level. The Sun-Sentinel sued, with their lawyers arguing the meetings could potentially violate Florida's Sunshine laws if more than one school board member attended and they spoke about issues that could come before the board for action. Lara Kalidyn, whose son is a senior at Stoneman Douglas, has a parent meeting scheduled for next Monday, but she said she would like to hear questions from parents of all grade levels. "The reality is, we are not safer," Kalidyn said, as she held a sign that read "Protect Our Children, Fire Runcie." "They tell us that we now have single point entry or that it's not as open of a campus. False!" Kalidyn said she drives by occasionally and has seen different gates at the school open during the day. "I am hoping that Robert Runcie gets fired because the safety measures that should have been taken have not been taken," she said. 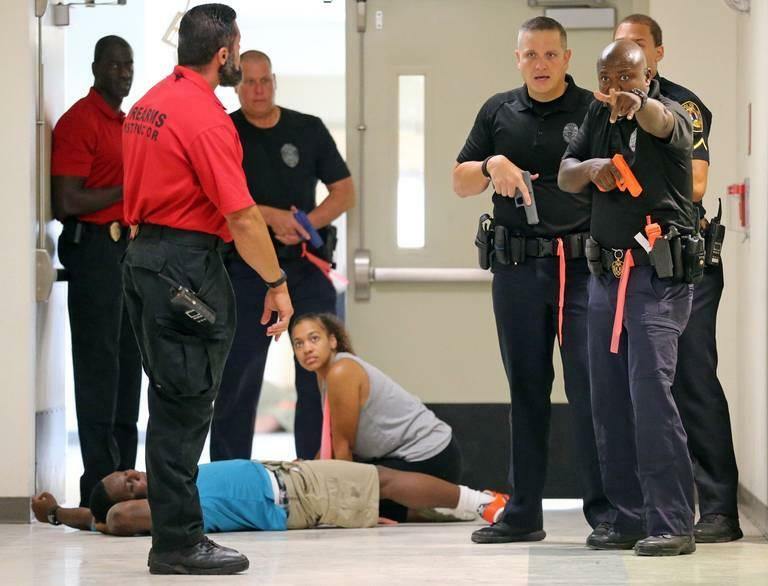 The school district installed what's known as a "single point of entry" at Stoneman Douglas over the summer and is in the process of establishing them at all schools in the district. The term refers to a system of gates and fencing that directs visitors to only one, secure door. Runcie said recently every school will have one by the end of the year. Broward County school board member Lori Alhadeff wants Runcie to hold nine town hall meetings on school safety. Alhadeff won the school board seat that includes Parkland and Coral Springs after her daughter, Alyssa, was killed at Stoneman Douglas last year. The board will consider her proposal for the town halls during a meeting Tuesday morning. Alhadeff said she's disappointed that Runcie recently canceled the Jan. 24 parent meeting and argued he did it in hopes of barring reporters and controlling the narrative. Runcie has said he canceled the meeting because there were social media threats of protests that he argued could endanger students. 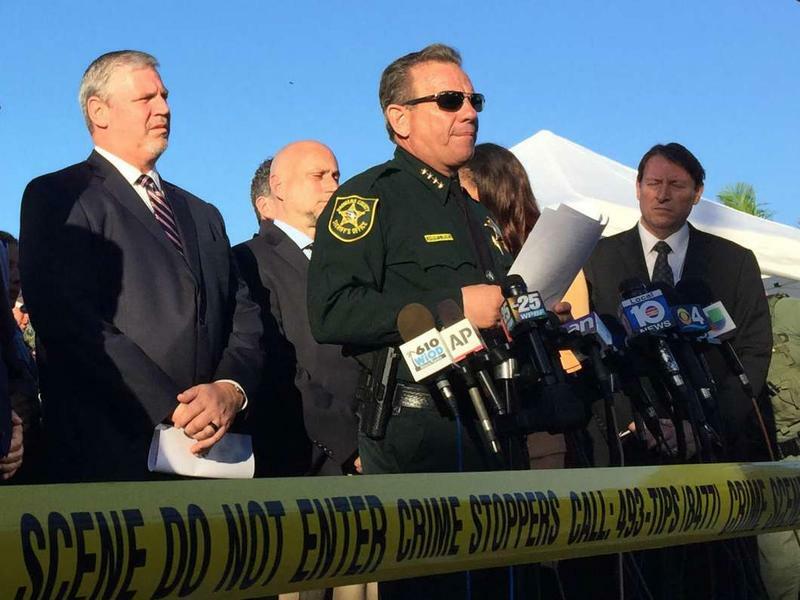 The superintendent recently held a news conference to outline the district's plans for implementing key safety measures recommended by the Marjory Stoneman Douglas High School Public Safety Commission, an investigative body created by the Legislature whose members have accused Runcie of lacking a "sense of urgency." The superintendent has taken issue with characterizations that he has been slow to act. Runcie stressed at the Jan. 17 news conference that the district worked aggressively to address Stoneman Douglas students' mental health needs, with limited resources. "We responded in an all-hands-on-deck fashion. We pulled counselors, psychologists, therapy specialists — everyone that we could across this county, pulled them out of other schools, reducing services there, so we could help meet the need of the MSD zone through that time of trauma," Runcie said. The pressure on Runcie to leave his post — and on the school board to fire him — is intensifying, with new Gov. Ron DeSantis, a Republican, stating he might consider whether he can remove them. The governor has said he doesn't believe he has the power to suspend an appointed official like Runcie but that he might consider "accountability" in the cases of the elected school board members. With President Trump scheduled to deliver his State of the Union address on Tuesday, Florida lawmakers are lining up guests. Education experts at the University of Florida are tackling an urgent question: How can schools be made safer without scaring or psychologically hurting students?